He is then put into an above elbow plaster and referred to our non union clinic. When seen now he is six months from initial injury unable to work and still wearing an above elbow POP . on exam out of POP: soft tissues fully healed no clinical infection no longer on antibiotics. wrist movements slight restricted but pain free pronation 10 degs supination 70 degrees elbow range 40 - 110 degrees pain free sensation normal Hand function normal except for Flexor pollicis longus not functioning 6 cm deficiency in ulna over to you for discussion. I'll leave discussion of the use of Ilizarov techniques to the experts of that technique. I think bone transport would work here, but I've never done it in the forearm. I think your best chance of success depends on eradication of infection. If you're sure he has no lingering pus (wbc normal, crp/esr normal), then I would proceed with reconstruction. Personally, I would plate him again to bridge the defect, and fill the gap with autologous bone graft. If I could get a solid construct, I'd allow early ROM. His intact radius will help you there. An intramedullary nail would be an alternative to a plate. The benefit of the nail would be that it's a load sharing device, rather than a load bearing device. Being centered in the bone, it is biomechanically slightly better. I think this matters less in the ulna than it does in the femur, though. Also, placement of the nail could probably be done closed (but you need to be sure his infection is really gone) and the reamings created would assist with union. Static locking of the nail likely wouldn't give you as rigid a constuct as ORIF with a plate, but maybe you wouldn't need that much rigidity. At least he's young. Does he smoke? If so, I'd try to get him to quit. Check ESR and CRP levels even consider a biopsy of tissue for culture to Rule out any residual infection. If infected stage reconstruction by debriding, treating with an antibiotic spacer and appropriate iv antibiotics. It looks like quite the gap. I would consider a replating and a free fibula transfer. 18 fractures with 1.5 to 4.5 cm segmental defect. Initial rx debridement, wound care, DPC, elimination of infection. Tricortical iliac grafting secured with 6-10 hole plate with 2 screws in the graft used 3 wks - 6 months after wound was healed. For both bone segmental loss - 5 cm of shortening acceptable to oppose 1 of 2 fractures while segmentally grafting the other. 10/18 pts started OOP @ 3.5 weeks. The major postop impairment was loss of rotation. No synostosis. 1 nonunion. 16 nonunions with gaps 1.2 - 2.5 cm rx'ed with corticocancellous interposed iliac graft with DCP plate. Shortening up to 1 cm does not compromise forearm function. Technique: Fibrous tissue excised, DCP with 8 preferably 12 cortices fixation. Postop long arm cast. 13/16 united in average of 13.5 weeks. Graft did not resorb in any case. The wider the gap, the increased likelihood of failure. 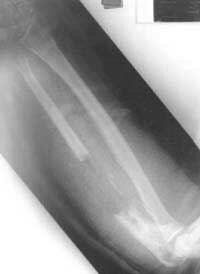 2 fractures occured after healing at the ends of the plate. 22 consecutive patients with open fx and segmental bone loss upper extremity rx'ed with exposed grafts of corticocancellous bone and allowed to heal by secondary intention. 16 available for follow-up. 10 patients with hand injury had no infection and union by 13.3 wks average. 7 grafts to forearms had 4 nonunions, 1 refracture, no persistent infections @ 30.2 months of followup leading authors not to recommend the technique for forearms. Treatment of infected segmental defect of long bone with vascularized bone transfer. Department of Orthopaedic Surgery, Hokkaido University School of Medicine, Sapporo, Japan. Experience with infected pseudarthrosis with segmental osseous defect, treated by debridement and microvascular bone transfer, is reported. Fourteen patients form the basis for the study, including 12 males and two females. Patient age at the time of operation averaged 35.1 years. Follow-up averaged 52 months. The affected site included tibia (10), femur (2), and ulna (2). A total of 15 vascularized bone graft transfers were carried out for the 14 patients, with the donor bone fibula (8) and ilium (7). Bony union was ultimately obtained in all patients. In 11 patients, primary union was obtained at both ends of the transferred bone segment. In the remaining three patients, a secondary procedure, consisting of onlay nonvascularized bone autografting at one end of the vascularized transferred bone segment, was required to obtain union. Recurrent infection following union occurred in one patient. One of the two patients with active osteomyelitis at the time of vascularized bone transfer had complications from recurrent sepsis, leading to the authors' caveat that vascularized bone transfer should be deferred until such time as sepsis is inactive. Criteria used in this series for determining inactive sepsis (absence of sinus tracts, negative bacterial cultures, negative c-reactive protein, and a sedimentation rate of less than 15 mm per hour) seem appropriate. The study suggests that vascularized bone transfer is a useful procedure for the treatment of infected segmental osseous defects of long bones, of more than 3 cm extent and one month or more after inactive sepsis. Treatment of a bone defect of the forearm by bone transport. A case report. Division of Orthopaedic Surgery, Stanford University School of Medicine, CA 94305, USA. The technique of bone transport has been used in the lower extremities to treat acute and chronic bone defect. It has not been applied to the upper extremities. An 8.0-cm defect of the ulna was treated with this technique, using a unilateral bone transport system. At completion of the transport, bone graft was brought to the docking site. A 4.0-cm radius defect was treated with free fibula graft and intramedullary nailing. Treatment was completed with removal of the external fixator at 10 months. Complication was limited to transient superficial pin site infection. I agree completely with Adam Starr with the additional comment that bone transport could be done here with a unilateral frame.